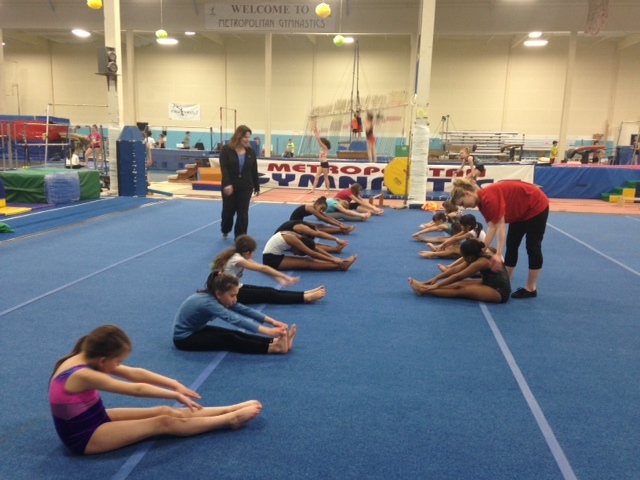 Recreational Gymnastics – Welcome To Metropolitan Gymnastics! Gymnastics is one of the premier sports in the Olympic Games because of its extraordinary combination of strength, flexibility and grace. We currently offer programs for everyone, aged toddler to adult. Please review our website thoroughly to find a program and class that best fits you! Our preschool programs are prim arily divided by age group. Class curriculum is designed with age appropriate activities and circuits to keep children active and moving. We have classes for children 18 months to 3 years (with parents) and 3-5 year olds (independent of parents). We also offer a Hot Shots pre-team program for 4-5 year olds. Click for details about our Pre-School Program. Our girls recreational program offers Beginning, Advanced Beginning, and Intermediate classes for girls starting at age 5. In Women’s Gymnastics, there are four events: Vault, Uneven bars, Balance beam, and Floor exercise. This discipline requires strength, flexibility, and a highly developed sense of kinesthetic awareness. Our women’s program is a year round fitness experience. Click for details about our Women’s Program. Gymnastics is great for the developing boys and builds strong bodies, joint flexibility, and special awareness. Men’s Fitness magazine in a 1996 survey concluded that gymnastics was the toughest of all sports! Boys who participate in gymnastics have a head start in mastering other sports because the task-demands of the activity are great preparation for virtually any physical activity! Click for details about our Men’s Program. The High School Class is perfect for first-time gymnasts and experienced gymnasts alike! This class features both structured gymnastics training and conditioning, as well as individualized skill work on all competitive events. This class can function as a fantastic supplement to the High School gymnastics season or a way to train and improve skills in the off-season. 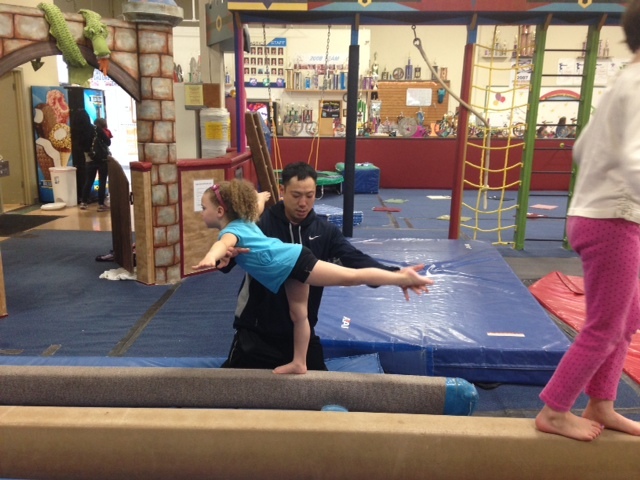 Gymnastics is great fun and fitness for all ages, ranging from the young to “young at heart”. Our adult program is a great opportunity for adults to stay fit in the gym. C’mon in and swing with us, whether you are a beginner who wants a unique exercise regimen or a former high (or any other) level competitor! We offer adult classes three days a week. It is strongly recommended that any adult consult a physician before starting a fitness program. Click for details about our Adult Gymnastics Program. The Movers and Groovers class is co-ed (ages 4-18) and is adapted for children with Special Educational Needs and/or Special Physical Needs. Each gymnast is required to have an assistant to participate. Our Mission is to develop and nurture each Child’s individual needs in a safe environment, as well as challenge your children’s physical and cognitive skills. Our programs are designed to challenge your children in ways that cannot be challenged in a classroom. The first class is free! Participants must purchase a $100.00 punch card for 10 drop-in classes. There is also a 1-time membership fee of $20.00, but the first year of the annual fee is waived for Mover and Groover participants!